LiveCode LessonsData GridLiveCode Data Grid Working With Data Grids (Forms & Tables)How Do I Determine The Selected Line? You can get the selected line or lines of a data grid using the dgHilitedLines property. If you need to determine the line number of a row's behavior script you can access the dgLine property of the row template. 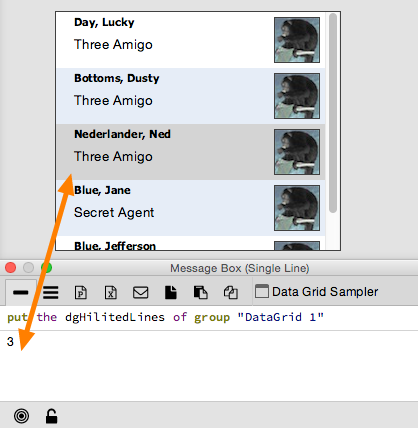 The data grid automatically assigns the dgLine and the dgIndex property when displaying the row. Note that the use of 'of me' (1) can be used because the mouseDown handler is in the row template group behavior script (which is as if the script were in the row template group itself). If you were to put the mouseDown handler in the script of a button that was located in the row template group then you would have to use 'of the dgControl of me' instead. Next: How Do I Get Data Associated With a Row or Column?